I just came back from International Orange, my favorite yoga place and spa. I was in the midst of conversation with the girls who work there as a few of us were ogling a new bag they had in stock. The Jane August Handbag is a stylish shoulder/tote bag that can fit just about everything. International Orange decided to sell the bags because it was actually big enough to fit a yoga mat, some clothes, wallet, keys, and probably even your laptop as well in durable stylish leather or suede. One other customer who was waiting tried on the bag and even joked "You can probably fit your boyfriend in there." The bags are kinda pricey ranging around $600 and up, but considering how much use you'll get out of this (plus compliments), it shouldn't be too hard to convince yourself to splurge. 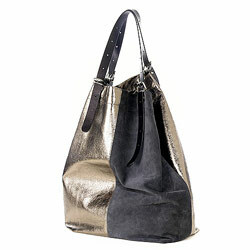 The bags at the store came in copper leather, blue silvery leather, black suede and brown suede. The gold metalic and suede version was all I could find online at the moment. I'm definitely a new fan of Jane's. 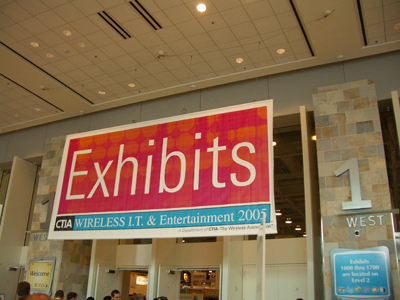 Today is the last day for the CTIA Wireless IT & Entertainment 2005 Conference at the Moscone West here in San Francisco. It was definitely a busy conference filled with men in suits all around hoping to make their next big deal. "Lets do lunch!" "Let's do some biz together!" "Let's do..." Oh nevermind. For me, I was in my tech element but maybe from the outside I looked too "Forever 21" as I smacked my new Chanel lip gloss and went basically incognito into the exhibit floor. It was strange and yet also exhilarating to browse around low-key and only talk if I really really wanted to ask a question. All the photos from the conference are here => flickr photos . The Nokia booth was great. I got some Nokia mints and I finally got to take a look at the N90 close up and I still like it. (Sorry Eric!) It was lighter than I expected and the resolution on the screen was super clear. 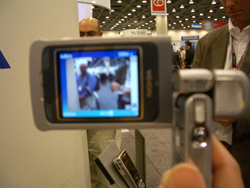 It is definitely more of camera/video recorder that happens to have a mobile phone rather than a full scale phone. I still love my Blackberry because of its email access but I have problems actually talking on the phone. Sometimes I can hardly hear someone. I overheard at the Blackberry booth a press man talking about how he can't seem to have good connections to make calls. Of course I chimed in and agreed. The Blackberry woman there said that it could be our coverage here in SF because she had heard of the problem but that she lived in Canada. Apparently it has to do with the physical phone and how it has to make all these data connections. Nevertheless, I'm on the lookout for something, but not in a huge rush. I saw the new Motorola Treo phone. It was very light and very thin. I was around all these "important" looking men who were talking about it so I heard that it is coming out soon, although I couldn't get a word in edge-wise to ask when it was coming out or through which carrier. At least they let me hold it and take some pictures. 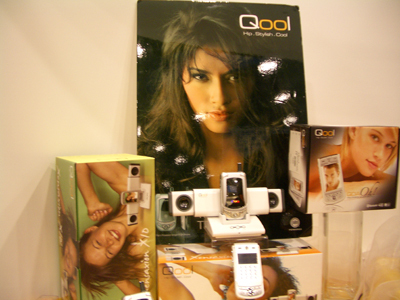 A company called Qool was there from Singapore. 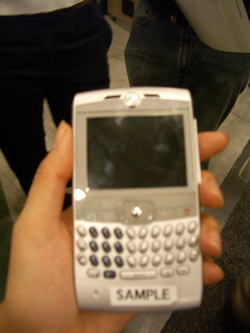 They were showing off their new Pocket PC phone and I was really impressed with the design of it. It had a funky push button interface and you could flip it up and access the PDA of the phone. It had a plastic level that you could actually detach the flap if you wanted to. Plus it was one of the lightest Pocket PC's I have ever held. Overall, there wasn't much new stuff to see and it was a bit overrated. I didn't see anything interesting or new in mobile entertainment either. What I came away with is that mobile phones are starting to get lighter as they do more. Which is a good thing. The final highlight was to see my longtime friend Andy of Orange Photography shout my name as he was taking pictures at the VeriSign booth. 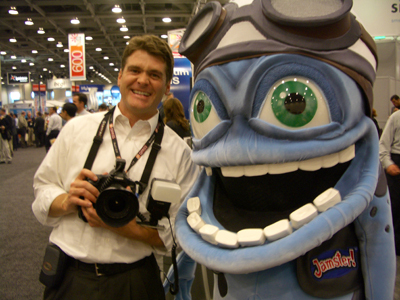 He's here with frog man, the VeriSign mascot, where he was assigned to take pictures of conference attendees with the kooky-lookin' amphibian. Apparently this frog is big time in the UK. So I thought what the hell, and took a picture with him. In a sea of conference dudes, it was nice to see a familiar face even if it was next to a guy in a frog suit. I try and read the paper everyday and recently gave myself a subscription to the NY Times newspaper edition. You know the one that actually gets delivered to your doorstep. As much as I spend my life online, reading is just so much better on paper. The Thursday Sunday Styles section as well as the Sunday edition is worth it alone. While reading through the business section a few weeks ago, I came across an article on Glam.com, a new fashion web site that had been in development for the last 2 years and was just about to launch. I've seen so many fashion web sites get touted and fail over the last few years, so I decided to see just what was different with this one. Could this possibly succeed? So instead of blogging about the site right away, for the past couple weeks, I've kept my eye out on Glam.com (now in beta release) to see just how well it matches up. What I found was a pleasant surprise. Each time I visit the site, they seem to be adding much more content. And even though the whole site is an advertisement for goods, it works. I really LOVE it. The editors have really found a balance of finding goods that are in everyday price ranges as well as high-end. The site is pretty technically up there as well with a bottom panel that shows you thumbnail of pages you have recently viewed. From The Best of Casual Pants to Tips for Staying in Shape the range of topics is pretty complete. There's even a beauty goods rundown for skin care, cosmetics, fall runway fashions, editorials on fashion designers, and more. The most powerful thing this site has over Vogue or Lucky magazine is that you can click on almost any product and purchase it right away. I really like the personalized aspect to this site. You can get yourself a user name and save favorites for a later date. 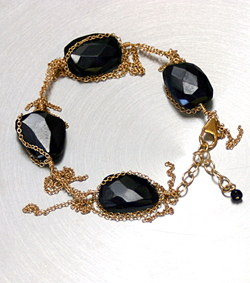 The fresh and realistic take on fashion and women's lifestyle makes Glam.com a site too keep in your fashion bookmarks. If you ever wondered what happened to those old mixed tapes you made back in the 80's during junior high school, look no further. It turns out, some of your old cassettes have turned into fabric. Yes I'm serious. Sonic Fabric is creation by artist Alyce Santoro who took her archive of old cassettes and actually created a textile women from the cassette tape. Oh and the best thing is, you can actually play the fabric it by drawing a tape head over its surface. 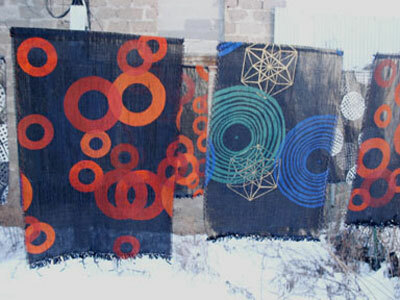 Since the fabric is weaved with multiple strands together, you end up hearing a mix of around 16 to 20 tracks. You can purchase the fabric by the yard to make your own creations or purchase some of their goods online such as the beautiful Sounds of (1/2) Life Tell-Tail Thangka flags shown here which are inspired by Tibetan Buddhist prayer flags. Definitely a interesting new spin on recycled goods and portable wearable audio. I'm pretty glad that black is back in fashion for fall. 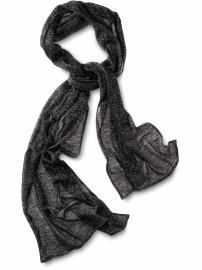 There's nothing sleeker, more versatile, and dramatic than black. Black goes with everything. I've chosen here a few items I like that can fit any budget and daily style. 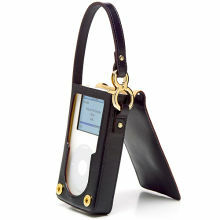 A sleek leather case with gold fixtures and an adjustable strap makes this iPod case an essential. A steal at $75. 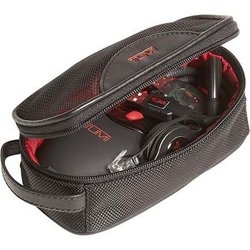 When you are on the go for that business trip or meeting downtown, this handy black case is filled with the essential accessories for your laptop such as a cordless mouse, retractable network cable, USB powered task light, and USB extension cable. $100. Nokia has been consistently doing some smart things. Not only are they creating some of the most fashionable and stylish phones, they've really tapped into how mobile phones are a new social medium. 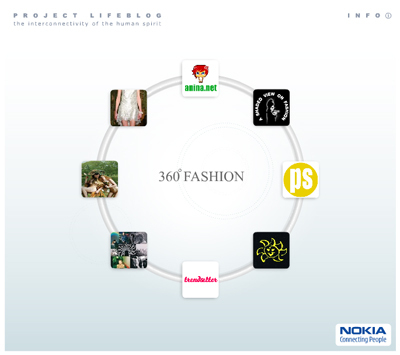 The 360 degree Fashion Project Lifeblog is a project about fashion and technology through mobile phones. Each of the blogs are of people in the fashion industry, a model, a journalist, a photographer, etc. 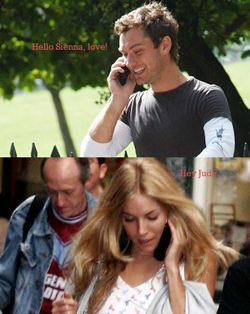 And each of them use their phones to upload content to the Lifeblog. You can have your own Lifeblog as well if you have a compatible Nokia phone. 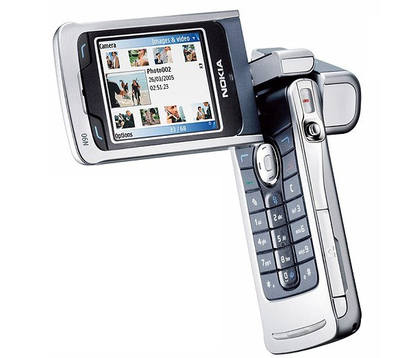 And lets just say if I were to buy a phone today, I'd get the new Nokia N90. Its sleek and is also a nice video camera as well. Too bad I will wait forever for 3G to come to the U.S.
London girls and Harajuku girls are known for their innovative sense of street style. A mix of mod/vintage style in the UK is highlighted today in London's Catwalk City, a site that showcases daily street fashion. I love how she's accented her black and white outfit with a big bright yellow fuzzy scarf. Makes me think that they weather there is starting to get just a bit brisk and it would be nice to have a pint in a Notting Hill bar with my fav brits Paul and James. With just a click, another world away is Tokyo Street Style, a similar site that showcases a multitude of photos of street fashions featuring Tokyo's five districts, updated weekly. 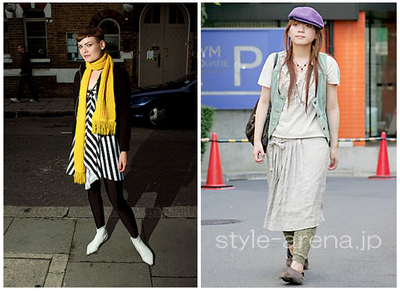 In Harajuku, a Japanese Mary-Kate (or is it Ashley) strolls along the street in her boho / oversized modern look. I'm hoping for more fashion/trends sites like these with real people showcasing their different sense of style. For about the past four years I've used a piece of fabric covering the keys of my laptop to protect the screen on my Mac Titanium laptop. Its a fabric remnant of a tote bag I was going to make but of course never did. I just liked it because it infused a bit of color with its pale spring mix of blue, pink, yellow and green all formed in a stripe pattern. It was something cute that I liked when I opened up my laptop. I had seen the other guys at the tech conferences with their rubbery plastic keyboard cover in a thick mustard hue which looked as if like someone had just poured rubber cement into a mold. Sure it protected the screen from my oily fingers, but it was just plain boring. iSkin the makers of iPod and Shuffle protectors, actually have Laptop keyboard protectors as well. They come in these variety of colors so that you'll never think "boring" when you open your laptop. Also, you'll be protecting your keyboard from dust and dirt build up. I'm definitely throwing away the o' piece of material and getting myself one of these. There are also keyboard protectors for regular and wireless keyboards as well. I don't think I've ever mastered the art of folding a t-shirt, even though I have secretly envied those people at the Gap who can do so. I'm sure Martha would be after me if she saw some of my drawers. Take a look at this quick 20 second video from Japan on How to fold a shirt. (I love that this is Flash video .) You don't have to understand Japanese at all to figure it out. She does a great job demonstrating it. I actually tried it and it worked! It lessened the bulk of my t-shirt drawer and I can now fill more shirts in. Martha of course has been doing this all the time and has step-by-step illustrated diagrams as well. Something fun you can try out this Sunday on laundry day.